Well, actually I NEVER PLAYED this game. It really has nice and warm atmosphere, I know almost every major plot line from the game (again thanks to Vezon and random walkthrough's parts) and I must admit - this game has something charming, really. The story (yeah, it is, in this crazy but cute world), the characters, the ATMOSPHERIC MUSIC. "I don't need anything, nor anyone, I just need you Saxaphone Buddy"
Sans is pretty good drawn! No worries about that! Btw, it's a cute drawing! 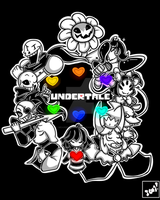 Don't worry, your not the only one who LOVES undertale but hasn't played it. Actually I had, just look at my newest art's description. Your style is adorable! I love it! well you can draw sans better than i can! I don't think so, but hey, thanks! Why is Alphys so ashamed? Got it. Does she look like that at sometime in the actual game? Oh and thanks for the badge! I can't draw skeletons period. Your amazing. Thank you! But I really don't think I can draw skeletons something good. Meh. Your better then me still. I better start trying to draw skeletons so I can join the undertale drawingness and if for nothing else, so I can just draw sans and papyrus. Heh, well thank you anyway! Actually I am not really a fan of Sans or Papyrus and really don't draw them really often... So I think that's the reason I don't really like how they are came out. Try more and everythink will be awesome! I did it! I drew sans!! (And I added a oc) I'm actually not that bad. Of course, I still have papyrus to draw...plus, look in info. You can't really read the words. Thanks! I thought I would never be able to draw him! Or my oc! And, it was pretty much my first try! That's really good, practice more and everything will be cool!